Error: -2147190908 – Failed to export the report. While At Your Service Software, Inc. is providing a limited amount of technical information here to assist you in setting up your operating system, it is ultimately the responsibility of you and your company to work along with your computer support technicians and consultants to evaluate, select, install, test, and maintain these systems. At Your Service Software, Inc. does not provide support for installing, configuring, administering, or troubleshooting Microsoft Windows software. On November 17, 2015, Microsoft released Windows update KB3102429 which updates Arial and other fonts to include the Azerbaijani Manat and Georgian Lari currency symbols. Further, on December 8, 2015, computers configured with automatic updates had this update automatically installed. This update is breaking the PDF export in the third-party SAP Crystal Reports component that was used by AYS for writing and printing reports. Option 1: We have proactively upgraded the Crystal Reports PDF export component to a newer version that does not appear to be affected by the Microsoft update. This new component is included in AYS service pack 3.4.057 and later which may be downloaded from our web site. Installing this update will require a full uninstall and reinstall of the program. The new PDF export component will be available for users with a software license of version 3.4 or newer. If you have an older license version (3.3 or older) then please contact AYS sales for a quote to upgrade your license to the latest version. If you do not wish to upgrade at this time, then you may instead choose to try one of the other two resolution options. Option 2: Uninstall Microsoft Windows update KB3102429 and, if the option is available, mark the update as hidden so that it is not accidentally installed again in the future. Please see details in the following sections for further instructions. Option 3: Upgrade your operating system to a newer operating system such as Windows 10 which does not appear to be affected by this issue. To locate and uninstall the update, click “PC Settings” and then locate and click “Control Panel” on the bottom of the screen. 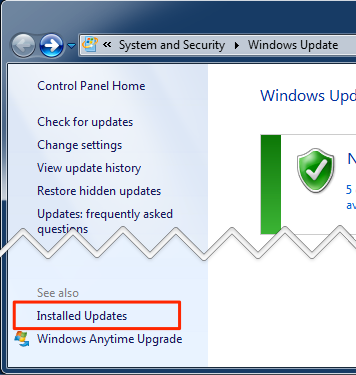 Find and launch “System Security” – “Windows Update”. The procedure that follows is the same as for Windows 7 below. 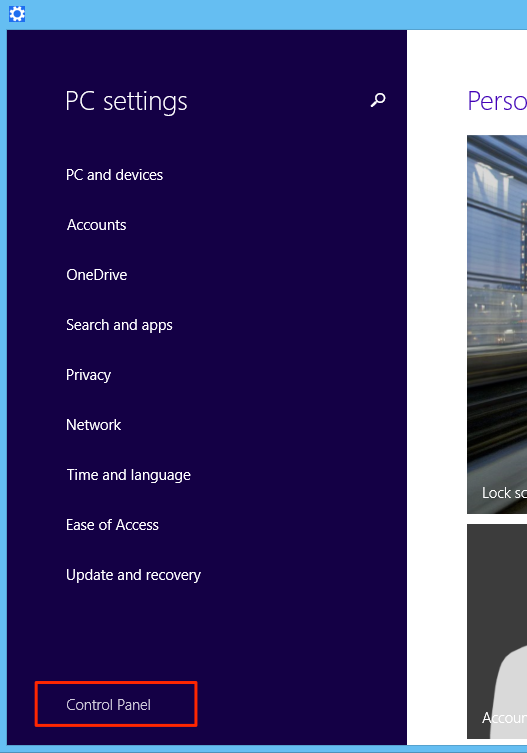 Step 1: Launch Windows update, and locate “Installed Updates” at the bottom left of the screen. 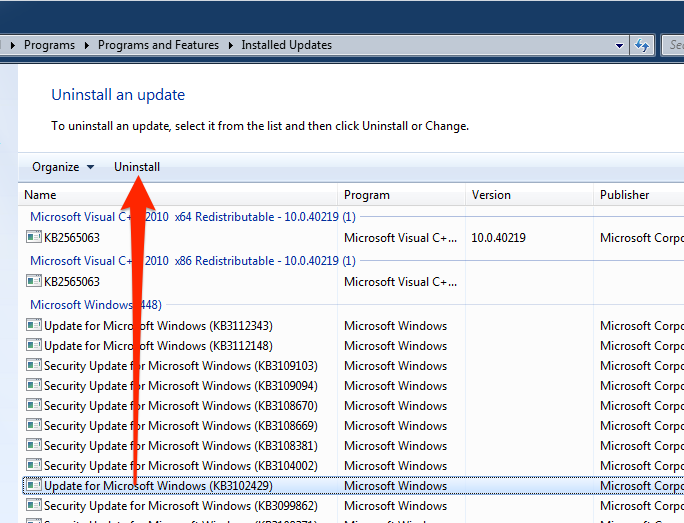 Step 2: Locate the list item reading “Update for Microsoft Windows (KB3102429)”. Select the item and click “Uninstall”. You will need to reboot your computer to complete the process. Step 3: Important: To prevent the patch from being reinstalled the next time updates are applied, select “Check for Updates” on the Windows Update main screen and choose the “Important Updates”. If you see the KB3102429 update in the list, right-click and select “Hide update”.